Leslie Backlund is a long time member of the Guild of Creative Art serving as President for several terms. 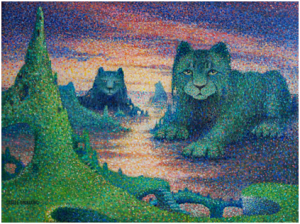 A member of the Pastel Society of America, she is also a distinguished master of many media and styles, including pointillism, which has earned her several awards. She has a degree in elementary education, which helps her bring out the talent and creativity in her students, young and old. Leslie provides individual attention to students of all levels of interest and ability, from age 7 to adults. Students learn drawing, composition, and color theory while working on their own choice of subject matter. Students also have the opportunity to participate in exhibitions exclusive to Leslie’s students. She also offers a portfolio review for art majors preparing for college.